We welcome anyone with a "green thumb" who has an interest in gardening and horticulture. We are developing our gardens and plantings to play a key role in supporting our educational programs and for general enjoyment. There are many interesting native trees, shrubs, and wildflowers in the 150 acre oceanside nature preserve at Eagle Hill, some of which are rare. We are interested in adding to the diversity of our native Maine species. Roadside wildflower enhancement plantings. We have been thinning the Eagle Hill roadsides in order to open up the perimeter understory. If you enjoy learning about rare, endangered, and interesting wildflowers native to Maine, you are welcome to help by planting them on the roadsides and tending them. One of our alumni propagates native Maine species and is willing to share them with us. Wildflower salvaging. If you feel sad about the decimation that real estate development causes to natural areas and would like to help, you can do so by salvaging at least some rare, endangered, and interesting wildflowers that are native to Maine. These can be transplanted at Eagle Hill, either as mats of vegetation or as "plugs." Herb and vegetable gardens. We have a number of organic garden plots with deep rich soil that test perfectly for growing vegetables and herbs for the dining hall and restaurant at Eagle Hill. The soils were composted from seaweed, peatmoss, blueberry leaves and culled berries, and forest leaves. Cut flower gardens. We have a number of gardens located over our septic fields. 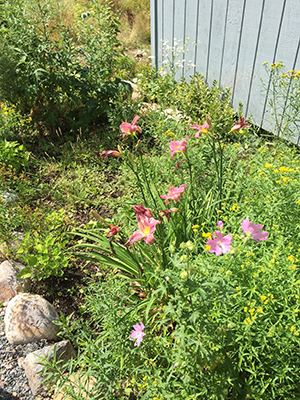 If you enjoy the working with wildflowers, you are welcome to help enhance these ever changing gardens, perhaps with "splits" from your own perennial garden. These gardens are pleasant to walk through, plus they provide us with cut table flowers and dried flowers that can be enjoyed indoors. Greenhouse seedlings. If you have a greenhouse with some extra space, you can help by starting seeds early for eventual planting in the gardens.